The hubs and I are very happy where our home is located, but there are a few negatives about our location. Problem #1 - we are at least 20 minutes to the closest Farmers Market. 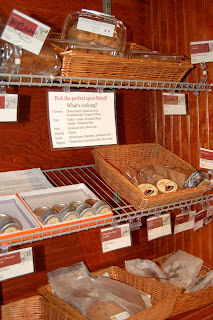 Problem #2 - no specialty or health food stores close by. Problem #3 - good restaurants (as in anything but a chain) are usually a drive as well. Problem #4 - I don't always have time to make it to the market, health food store or good restaurants! So basically, we thought of everything about our location - schools, police, fire station, hospital, Target....just not access to good food. Crazy, right!?!? Well, LoMo Market is here to solve all our problems! I discovered LoMo a few months ago through social media and have loved them ever since. LoMo Market is a local mobile market, providing local and high quality foods in a convenient trailer that comes to you. They move around, based on demand and it just so happens they started coming to my neighborhood last month! LoMo is a win-win. 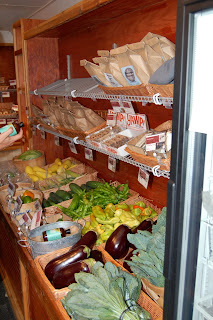 They make local, healthy goods accessible to consumers, and they expand the clientele for the farms and local vendors! Every Wednesday, Ryan and I walk down and stock up on goodies from produce and feta cheese, to spices and local meats, then come home and cook it all. The market also stocks items from local restaurants and bakeries. I can always count on a gluten free cupcake from Bread Uprising and gluten free dumplings from Kimbap! They even have fresh seafood straight from the NC coast. We tried the tilefish and all it needed was a little salt, pepper and olive oil in a saute pan. I can honestly say it was more fresh than Whole Foods seafood! LoMo has several trucks running around the Raleigh-Durham-Cary-Chapel Hill area now, so check out their schedule and stop in!! Saute mushrooms in a little bit of butter over medium heat. After the mushrooms have cooked down a bit (3-5 minutes), add in the eggs and scramble until cooked. 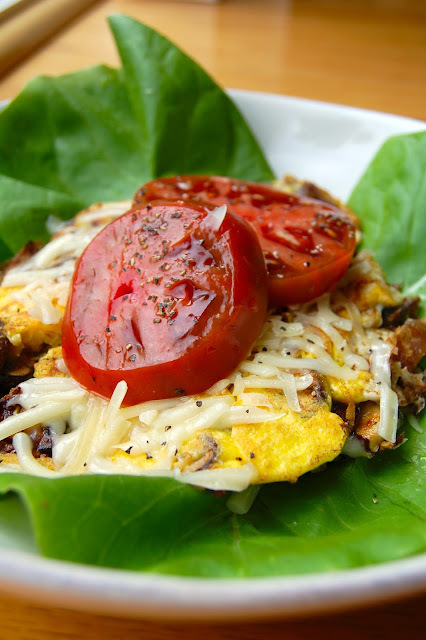 Layer the lettuce on the plate, then eggs, cheese, sliced tomatoes, salt and pepper to taste. It has been 7 months since I have been able to walk into a restaurant and be able to eat anything on the menu...until this past weekend. Since I was one of the bloggers for the Gluten Free Allergen Free Wellness Expo in Durham, I was invited to join fellow bloggers and organizers for a gluten free dinner with wine pairings at Bella Monica. First of all, if you haven't been there, go! 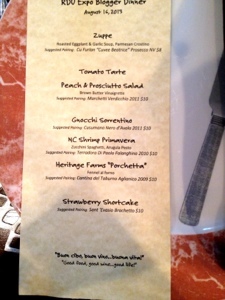 It is the closest to authentic Italian cuisine that I have found in the Triangle...and I lived in Italy for 2 months! This is a family run restaurant, based on family recipes and everything is delicious! The best part about Bella Monica, is the separate gluten free menu. They have gluten free pizza, pasta, ravioli, even gluten free tiramisu, my fav!! But this past Friday, Bella Monica's chef really went above and beyond for us bloggers! They made an entirely special gluten free feast for all of us, and even catered to those with nut and dairy allergies. 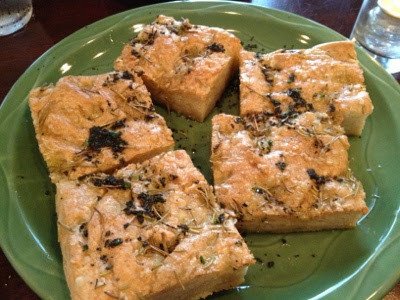 Gluten free Foccacia bread, their staple first course, is made locally by de'Lure' Bakery. This was amazing and didn't taste at all like gluten free bread. 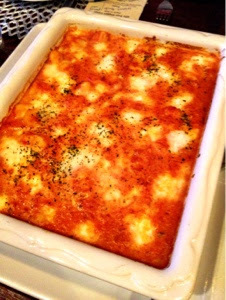 It is crispy on the outside, gooey in the middle and then covered in warm olive oil and fresh herbs!! I think I ate 3 pieces before the first course. 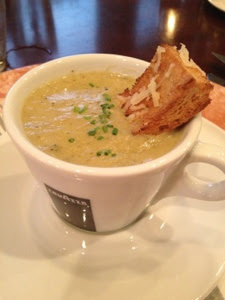 Next up, Roasted Eggplant and Garlic Soup with Parmesan Crostino. This was delightful and caught most of us by surprise. The roasted garlic was perfectly paired with the eggplant flavor and the crostino was the just the addition needed to scrape the bottom of the bowl. 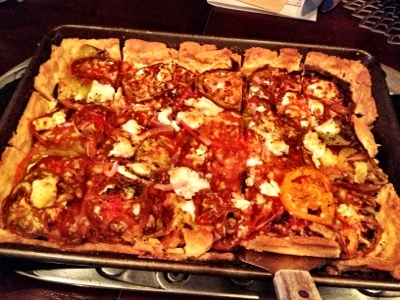 The group also went crazy over this Tomato Tarte. We were begging the chef to let us know what was on this...tomatoes, red onion, basil, thyme, goat cheese, olives and cream cheese. The crust was buttery, flakey and thin. This was the point of the evening when I knew I was going to roll out of the restaurant! 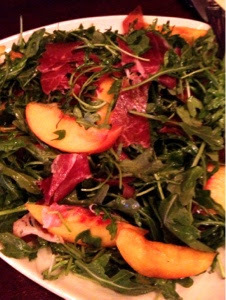 Pictured below is a Peach and Prosciutto Salad with a Brown Butter Vinaigrette. Gluten free Gnocchi Sorrentino!! And a huge vat of it!! Covered in Nana's gravy!! 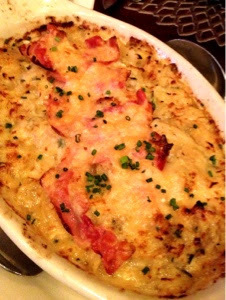 What else can I say except this made many gluten free eaters VERY happy. 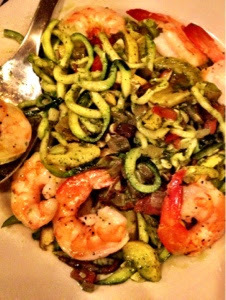 Then they brought out Shrimp Primavera with zucchini noodles, local shrimp and arugula pesto. Good to know I am not the only one that has discovered zucchini noodles! Next time, I will mix in pesto though, yum! The pork dish (Porchetta) was also very good, but by this point I was so full, I could barely eat one more bite. 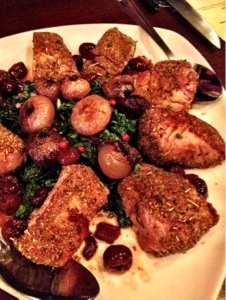 The tenderloin was covered in a spice rub, then perfectly cooked along with broccoli rabe and pearl onions. It was served with Fennel al Forno that was so good I wanted to swim in it! I knew it was coming, and forced myself to make room for it. 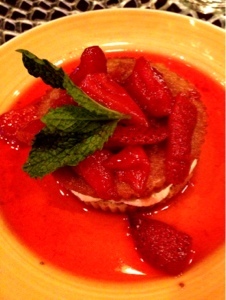 How could I turn down a Strawberry Shortcake made just for our group! It was perfect, spongy and cakey, sucking up all the sweet berry juices and whipped cream in the middle. Ah, I was in gluten free heaven! Even though I haven't posted in a while, doesn't mean that I am not cooking and eating to my little hearts desire! Work has just been busy and kept me from writing about it. But I'm never too busy to give some food love to my followersI There is no better food love than that of a fresh, juicy peach in the summer time! And there are millions of them right now (according to the Presidents of the USA....come on 90's music fans). I put this boozy doozy together last weekend and had to share. 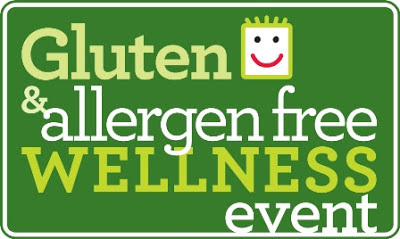 For all my gluten free friends or anyone with a food allergy, don't forget about the Gluten & Allergen Free Wellness Expo this Saturday in Durham, NC. There will be tons of yummy treats and entrance is only $10. Preheat the oven to 375F, with a rack in the middle. Butter an 8x8 square baking dish and set aside. Cut a small cross in the bottom of each peach, just piercing the skin of the fruit. Fill a medium saucepan with water and bring to a boil. Place each peach in the boiling water for about 30 seconds and quickly remove and set aside to cool. 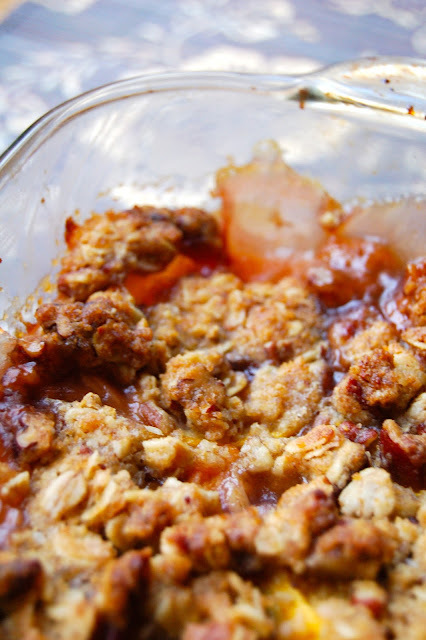 Combine the flour, pecans, oats, brown sugar and salt together in a large bowl. Use a fork to stir in the melted butter. The mixture should form into a few patties, then wrap in plastic wrap and place in the freezer to chill at least ten minutes. Skin the peaches by pulling the edge of the peach skin (near the cut at the bottom) with a small knife and your finger. The skin should peel off easily. Slices the peaches and set aside. Make the filling by whisking together the cornstarch and sugar in a large mixing bowl. Add the peaches and toss until evenly coated. Wait three minutes, add the bourbon and toss again. Transfer the filling to the prepared pan, remove the topping from the freezer, and crumble across the top of the peach bourbon mixture. Bake for 35 - 40 minutes, or until the topping is deeply golden and the fruit juices are vigorously bubbling along the sides. 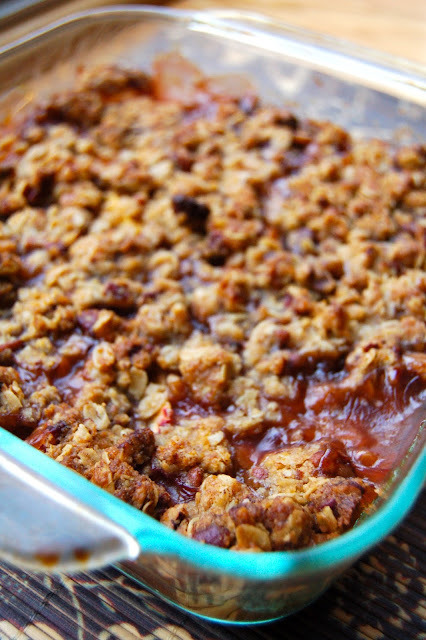 Wait at least 30 minutes for the crumble to cool before serving. Marriage. It can be amazing and challenging at the same time. It is a partnership that takes two people contributing equally. This is something Ryan and I have learned from two great marriages. Today, my parents celebrate 43 years of marriage! That is quite an accomplishment, one that Ryan and I look forward to achieving one day. I would be remiss if I didn't also mention the other big anniversary in our lives, 34 years. Ryan's parents would have hit 34 years of marriage this past month. Easy to see that we have some amazing role models in our lives and for our relationship. 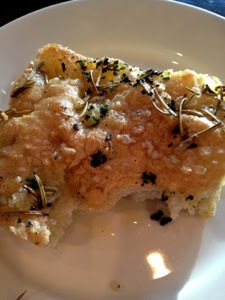 I started this blog when we got married, in an attempt to capture recipes that we both enjoyed. After more than a year, it has grown to be something that we both contribute to. Something that has brought us together with food, excursions and, most importantly, compromise. So in honor of our parents and their everlasting love, I am sharing this romantic lava cake recipe. We once made this on a date night and felt like it was most appropriate for the occasion. Happy 43rd Anniversary to Rose and Chris!! Happy 34th Anniversary to Desiree and Dave!! Preheat oven to 425F and butter six souffle dishes very well. We like to soften butter and spread around with our fingers to evenly coat the dishes. In a medium saucepan over medium heat, melt the chocolate and butter. Stir constantly until chocolate is melted, about 5 minutes. Remove from heat and add in the beer and 1 teaspoon of the espresso powder, stir to combine. In a bowl, whisk the 3 full eggs and 3 additional egg yolks with the powdered sugar. Whisk well to combine and pour the chocolate mixture slowly over the egg mixture and stir well to combine. Sprinkle cocoa powder, remaining espresso powder and flour over the chocolate mixture and stir to combine. Divide the batter equally amongst the souffle dishes. Do not fill more than ⅔ full. Press a few chocolate chips into the center of each souffle dish. At this point you can make ahead and store in the refrigerator. Bake at 425F until the outside is set, but the inside is still liquid (about 9-12 minutes, depending on the size of the dishes). When it looks like the cakes need a few more minutes, then they should be done. Run a butter knife around the edge of the cake and place a plate on top of each ramekin. Quickly turn it upside down and lift the ramekin to reveal the cake. Serve immediately with fresh whipped cream or berries.